Asking us to post calcium-rich recipes, Susan from Food Blogga has launched an event, Beautiful Bones, to highlight a disease that effects so many people around the world: osteoporosis. Osteoporosis is a condition where the bone mineral density (BMD) reduces due to the body losing minerals (like calcium) faster than it can replace them. This causes bones to become thinner and more fragile and therefore fracture much more easily. The most commonly effected bones are some of our most important for independence and mobility, such as the spine, ribs, hips, pelvis, arms and wrists. I was shocked to learn that from our population of 21 million people, someone is admitted to an Australian hospital with an osteoporotic fracture every 8 minutes! As in our hostess Susan’s case, many people don’t even know they have osteoporosis until they break a bone and are accidentally diagnosed. For this reason, in Australia, osteoporosis is often known as a 'silent disease'. So why is calcium so important for our bones? Osseous tissue, the primary tissue of bone, is made up of calcium phosphate in a chemical arrangement known as calcium hydroxylapatite. Calcium is essential for all living organisms and is a signal for many cellular processes, including bones where it makes up the living cells of the osseous tissue’s organic matrix. For this reason calcium is crucial to grow, heal and maintain healthy bones. Participating in this event has been a great eye-opener for me. For instance, did you know that black beans, sardines, almonds, potatoes, rhubarb, romaine lettuce, tomatoes, bananas, grapes, kiwi, watermelon, cornmeal, rice, popcorn, black pepper and rosemary are all calcium-rich foods?!?!? Amazing! Throughout May, Susan has published some posts on calcium rich foods that are well worth a read and include some great recipes. 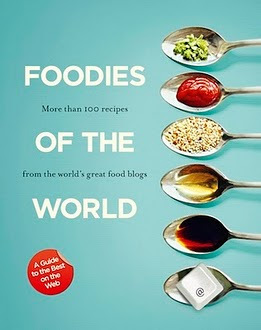 Regardless, be sure to check out the round-up of all the recipes her event has inspired for beautiful bones around the world. 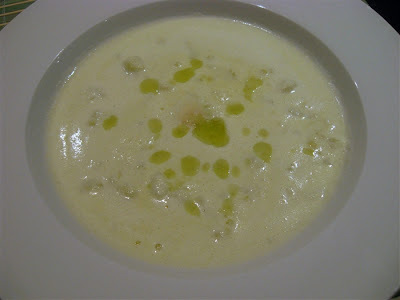 Now here is my own calcium-rich contribution: Cauliflower Soup w White Truffle Oil. The soup utilises milk while still highlighting the gentle flavour of the cauliflower, which really shines through. The luxurious finish of white truffle oil lifts the soup significantly and gives it a touch of elegance for any dinner party. If you notice a strange pinkish hue in my photos, that's just a scattering of pink Murray salt. Anna's very own recipe. Serves 4 as entrée (starter). 1. Heat oil in a large pot. Add onion then garlic and sauté until soft but not brown. 2. Add milk and increase heat. Cook for 1 minute. 3. Add cauliflower, making sure there is enough milk to cover. Add salt and white pepper to taste. 4. Bring milk just to the boil then reduce heat. Simmer with lid partially covering pot for approximately 20 minutes or until cauliflower florets are soft. You will need to check it regularly to ensure no milk skin forms. 5. Cool soup for a few minutes then strain into a blender. Add two thirds of the cauliflower florets to blender and return the remaining third to the saucepan. 6. Blend the soup to puree then pour over remaining florets. Reheat soup to serving temperature. 7. Divide into bowls and drizzle with white truffle oil. Serve with crusty toast. 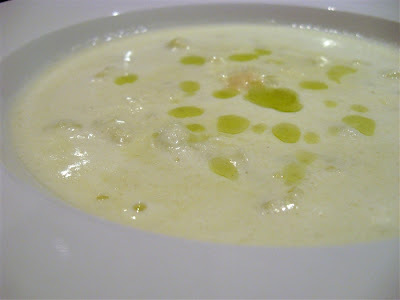 Note: This soup is very rich and pungent so it needs to be balanced by light following courses. Osteoporosis risk factors are split between non-modifiable and potentially modifiable. Non-modifiable factors include gender, age, race and family history. Women have a much higher chance of getting osteoporosis than men and advanced age brings on greater risks too. For women post-menopausal estrogen deficiency increases chances while a drop in testosterone levels for older men has the same effect. European and Asian racial profiles show higher propensity for developing osteoporosis than other groups and the heritability of low bone mineral density is relatively high so a family history of fracture also increases your chances. Potentially modifiable factors include excessive alcoholic intake, Vitamin D deficiency, smoking, low body mass index (underweight), malnutrition, lack of exercise (lazy bones isn’t just a saying!) and too much exercise (athletes) and excessive soft drink consumption. Yes, this last factor is a shock for many people who indulge in carbonated drinks! Some studies are indicating the phosphoric acid present in most of these soft drinks deplete or prevent calcium absorption. A former colleague of mine, Harry, was diagnosed with osteoporosis, something that came as a great shock to him. He had always consumed a lot of dairy as a child growing up in Ireland and had even been the CEO of a dairy company where he indulged in the same milk he sold to the schools around Sydney. When he was diagnosed with osteoporosis he couldn’t figure out how it had happened, until his doctor identified that drinking two 375ml cans of cola daily for the past 10 years may have cancelled out all the calcium he’d ingested. It’s important to start your nutrition and exercise regimes young since, as Susan pointed out, 90% of adult bone mass is acquired in girls by age 18. For those of you starting to feel nervous after reading all this, there are ways you can prevent a decrease in your bone mineral density. Studies point to aerobic, weight bearing and resistance exercises increasing or maintaining BMD. Actions as simple as treadmill walking, stepping, jumping, endurance and strength exercises have all had positive effects on BMD. The other key area is your diet! Salt, vitamin D, exposure to sunlight and calcium all play a part in bone mineral densities. Something else to consider is that other elements in your diet may effect your calcium absorption, such as over-consumption of protein, which causes higher levels of calcium excretion in urine, or drinking too much soda. This is a healthy breakfast. 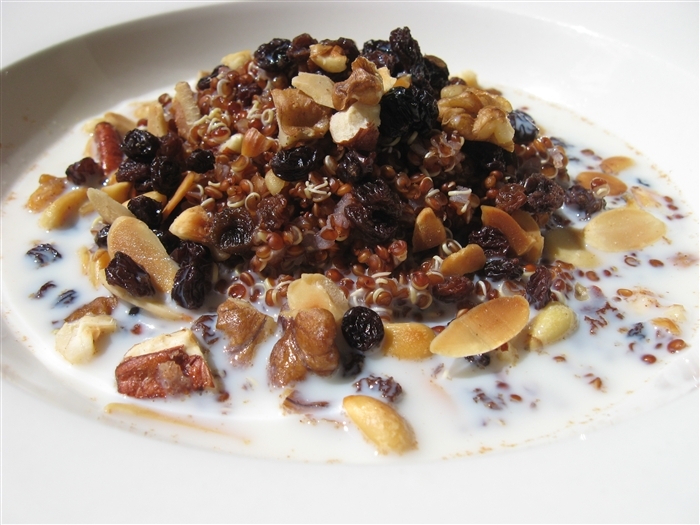 You can feel how healthy it is while you chomp away on soft, grainy quinoa, toasted nuts, chewy dried fruit and honeyed milk. I found the recipe on Closet Cooking, who in turn found the idea on real life foodie adventures. So it isn't just my own Recipe Road Test! I made adjustments so I warn you that the nuts and fruits do make it very chewy. If you want something with less texture then reduce the amounts. 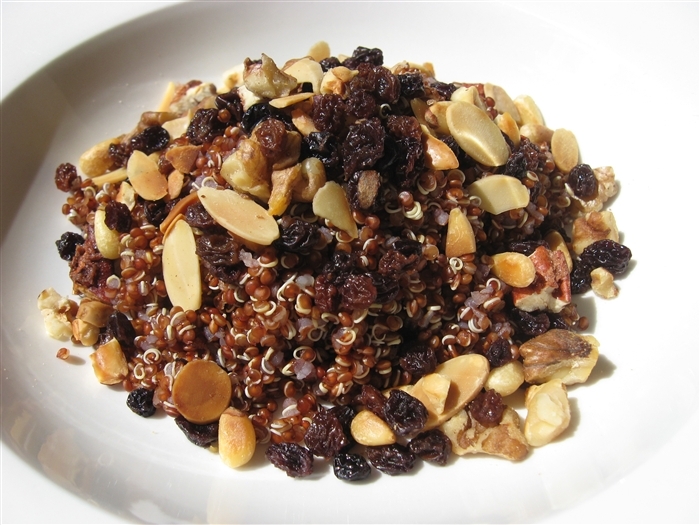 As the name of the dish suggests, the recipe also uses quinoa, a South American grain that I committed to cooking with as part of my 2008 food resolutions. This excellent breakfast is my entry to the monthly cooking event WTSIM, otherwise known as Waiter, There’s Something In My . . . and the theme ingredient this month is dried fruits and nuts. Our host is Andrew from Spittoon Extra, so be sure to check his blog for the round-up. Anna’s version of Kevin’s version of Michelle's recipe. Serves 2. 1. Heat the quinoa, milk, honey, cinnamon, orange rind, sultanas and dried figs. 2. Serve topped with toasted nuts. Anna’s variations: I used dark quinoa instead of light. I added orange rind and cinnamon to the cooking process and replaced cranberries with figs. I also changed slivered almonds to almond flakes as I prefer a lighter crunch. This is a really simple dish to make but nonetheless it adds something different to your table. The sweetness of the eggplant is counter balanced with the gorgeous sour and nutty flavour of the dressing, touched up with garlic, sumac and lemon juice. I highly recommend this dish, either as a salad or side dish, or even as a small starter. Anna’s variation on a recipe by Peter Evans. Serves 4 as a side dish. 1. 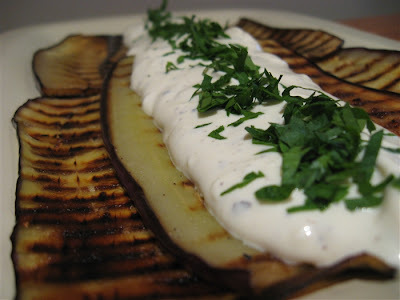 Grill the eggplant on the BBQ or frypan with the oil, until golden brown. 2. Combine tahini, yoghurt, garlic, lemon juice, pepper, sea salt flakes and sumac to form a sauce. 3. 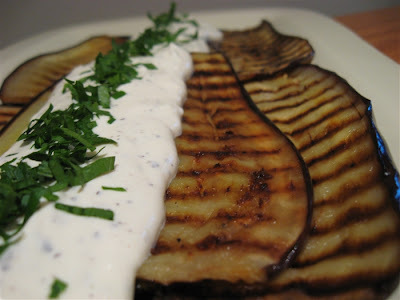 Place the eggplant slices on a serving plate and drizzle with the dressing. Garnish with parlsey leaves and additional sumac. Sumac is the name of all 250 species of flowering plants from the genus Rhus. Also known as sumach, sumak, summak, tanner’s sumach, sommacco, zumaque and sammak, in this particular case sumac refers to the spice created from grinding the Rhus coriaria’s dried berries. This produces a tart, sour deep red-purple powder which is extremely popular in Arabic, Levant, Persian and Turkish cuisine. Sumac berries form tight clusters of red drupes or bobs. They are harvested just before ripeness and sun dried. In growing regions you can buy whole dried berries whereas the rest of us need to make do with sumac powders. The powder keeps in an airtight container for several months. The Rhus coriaria comes from the Mediterranean but sumac in general grows in subtropical and warm temperate regions throughout the world. It has been used in Mediterranean cooking since Ancient Rome and is a major souring agent in Middle Eastern cooking, replacing lemon juice, tamarind and vinegars. North American sumac is also employed for culinary purposes. Native Americans used smooth sumac (Rhus glabra) and staghorn sumac (Rhus typhina) to make rhus juice, also known as sumac-ade or Indian lemonade. They would soak the sumac berry clusters in water to remove the essence then strain and sweeten the liquid. Other North American sumac includes Rhus glabra, an excellent leather tanner which produces flexible, light weight and almost white leather products, and Rhus toxicodendron, also known as Poison Ivy. Sumac is said to have diuretic effects and the assist bowel problems and fever. In the Middle East a sour drink is made from sumac to relieve indigestion. And one last weird fact: dried sumac wood glows under UV lighting. Who would have thought! That’s it for WHB for another week. Check out the recap with our host Wandering Chopsticks. Today is the end of National Vegetarian Week in the UK and Abby from eat the right stuff is hosting a celebration of all things veggie with her event Vegetables, Beautiful Vegetables. Given that my husband is a vegetarian and I have posted around 80 vegetarian recipes on my blog so far, I thought I should show my support for this event and participate with something interesting. As a meat eater I often miss meat when it’s omitted from certain dishes and feel some national cuisines lend themselves to vegetarian cooking much more easily than others. For instance Indian and Italian cooking can easily be vegetarian. In fact I prefer vegetarian Indian dishes over meat and fish ones and Italian cooking has more than enough delectable vegetarian pastas, risottos and other interesting fare to keep even a carnivore sated. My experience with vegetarian Thai food hasn’t been so positive. Having tasted both sides, I feel that many Thai dishes taste much better when there is meat or seafood involved. 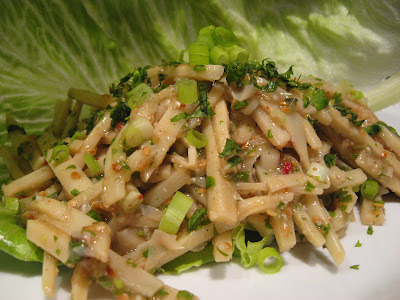 Until I came across this bamboo salad. It has all the spicy kick, sour tang and bulkiness of a beef or prawn salad, and it can be served in a strictly vegan fashion if required. Be sure to read my cooking notes after the recipe for tips on subsitutions etc. 1. Heat 2 cups of water to boiling in a large pot. Add the shredded bamboo and bay leaves and cook for 10 minutes. Discard the bay leaves. Drain and set aside to cool. 2. 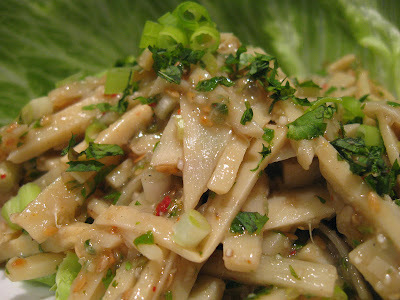 When the bamboo shoots are cool, toss with ground rice, fish sauce, lime juice, sesame seeds and ground chilli pepper. 3. Add the scallions, mint and coriander and combine well. 4. Serve immediately with warm sticky rice on a bed of lettuce and garnished with herbs. * If you let the salad sit too long after preparation the ground rice will start to become gluggy. * Vegetarian fish sauce is sold in many Asian grocers and made from fermented soy beans, salt, sugar, chilli and citric acid. You could also use tamari (light soy sauce) with additional salt and even some salted yellow beans and fermented tofu to add the required pungency. * I use bottled or packaged bamboo shoots. Fresh shoots make take longer to boil. * If you find the dish is too spicy you can add more toasted rice to counter balance the flavours. * If you can’t buy ground toasted rice from your local Thai restaurant, you can make it by heating a small frying pan on medium-high heat and adding cooked sticky rice. Toast the rice, adding 1 tablespoon or water at a time to aid in the cooking. Continue to toast the rice until it is golden brown. Remove and grind to coarse powder. My dad grew up in California and when my mother migrated to the US in the 1970s she learnt to cook some of the Tex Mex and Southern recipes of the USA. Before I was born my family relocated to Australia, but I was brought up on chilli con carne and cornbread as a regular weekly meal. I suppose that’s where my love of kidney beans began. I just loved the meaty-beany stew and the soft, warm, sweet cornbread alongside it. As I grew older and my parents divorced we ate these dishes less and less since both my mother and my father’s new partners weren’t big fans. 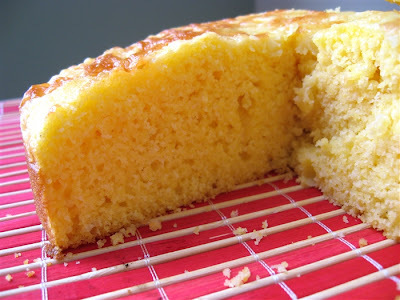 I really mourned the loss of this family staple so every now and then my mother would bake a batch of cornbread and we’d sit down and eat it hot from the oven, dripping with butter. When my mother passed away we lost her wonderful cornbread recipe, but I think Bethany’s family’s version comes pretty close. It has to be sweet, soft and hot. Then it reminds me of my mum. Based on a recipe by Bethany Weathersby. Serves 10. 1. Preheat baking tin in the oven to 180’C. 2. In a bowl combine vegetable oil, eggs and sugar and blend. 3. Add buttermilk and baking soda until combined. 4. 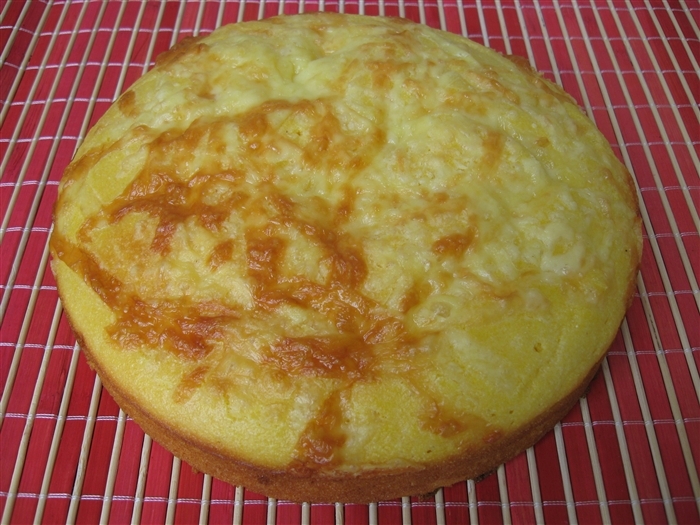 Gently fold in flour and cornmeal (and optional cheese) until few lumps remain, but do not over mix. 5. Pour batter into hot skillet and return to oven and bake for 20 minutes or until a skewer inserted in the centre comes out clean. This is my contribution to the Tastes to Remember blogging event hosted by Sarah from Homemade: Experiences in the Kitchen. I like the idea of this event, reminiscing about recipes, tastes and smells from childhood. This recipe is also another tick off my 2008 Food Resolutions list. This is the final day and the final recipe in my seven days of posts for Pickles & Preserves Week. And yet I believe I have saved the best til last! I have had a good run with figs this autumn. Usually they’re too expensive to buy and when I do they don’t have much flavour. But this year I bought them from a grocer in the centre of the city where every individual piece of fruit is wrapped in tissue paper (the way I imagine it is in Japan) and you pay through the nose for fruit you just know will be good. But even better I found a street stall where, on Friday when the grocer was packing up for the week, I bought a bucket of figs for $1! And so I made this conserve. I adore it. Just adore it! The figs are so intense and the seeds give the jam a gorgeous nuttiness. It has become my absolute favourite jam. Recipe by Kurma Dasa. Made 4 x 300ml jars. 3. Place the figs in a 5-litre/quart saucepan along with the lemon zest and lemon juice over moderate heat. 4. Bring them to the boil and cook them for about 10 minutes, or until they soften and the syrup darkens to a rich red colour. Do not stir them, and do not allow the figs to break up. You may need to add a little water. 5. Remove the sugar from the oven, and gently stir it into the figs, being careful not to rupture them. 6. When the sugar has dissolved, bring the mixture to a rapid boil and, without stirring, cook for another 10 minutes, or until the setting point is reached. 7. Carefully ladle the conserve into sterilised jars and invert until a vacuum seal is created. Kurma’s note: Because my figs had been frozen then thawed, they gave off a lot of syrup, so I added 50 grams of pectin, a natural jam setting agent, at the time I added the sugar. The result was spectacular. Anna's variation: my sugar has been infused with a vanilla pod a few days before using. I am submitting this recipe to a new blogging event, Putting Up, celebrating jams, conserves, jellies, marmalade, curds, butters, chutneys, pickles, relishes and preserves!!! The hosts are Pixie from You Say Tomahto, I Say Tomayto and Rosie from Rosie Bakes a Peace of Cake and I am really looking forward to the recipes the round-up will reveal! Everytime I suggested pickled grapes to Jonas, he kept doubting that such a thing existed. He was sure I had just gone pickle-mad and was inventing pickles out of anything that would fit in a jar. But I remembered reading about pickled grapes in Middle Eastern cookbooks, a classic example of the sweet-savoury balance the cuisine is so famous for. Jonas’ suggestion is to serve them as part of a Christmas buffet. The sweet-sour flavours, combined with the warmth of the cinnamon, would work perfectly on a traditional Swedish Julbord. My own recipe was a combination of recipes from Maggie Beer’s TV show and Julie le Clerc’s book Taking Tea in the Medina. Anna’s adaptation of various recipes. Makes 1 jar. 1. Cut grapes into small bunches, being careful not to break from stalk as this will allow pickling solution inside the grape. 2. Put vinegar, water and sugar and cinnamon sticks and peppercorns into small pot and bring to the boil. 4. Pour vinegar into jar over the grapes. 5. Seal immediately turning upside down to sterilise lid. This recipe is going straight to Weekend Herb Blogging's host Cate from Sweetnicks. It's my second grape recipe in recent times, so here's the link to my Grape & Spiced Nut Salad for those who might want to read up on grapes. This is recipe six out of seven in my Pickles & Preserves Week. Cinnamon brings such a glowing warmth to any sweet dish and, in my opinion, goes really well with peaches and apricots in particular. This simple preserve has chunky pieces of peaches, but it’s really important to use flavoursome fruit as there’s not much in this recipe besides peach pulp, so floury fruit yields a less than vibrant flavour. Anna’s very own recipe. Made 2 x 250ml jars. 1. Preheat oven to 180’C. Place a small saucer in the freezer to cool. 2. Spread the sugar on a tray and heat it in hot oven, taking care not to burn it (approx 10 minutes). 3. In a saucepan, add the peaches, lemon juice, cinnamon and a little water if needed. 5. Remove the sugar from the oven and gently stir it into the mixture. 6. Bring to a boil again, then simmer until the jam is thick and translucent (approx. 30 min). 7. Check to see if jam is ready by dropping a small amount onto the chilled saucer and allowing to set for 30 seconds. Run your finger through the mixture. If it wrinkles rather than runs, it has reached its setting point. 8. Remove from the heat and pour into jars, tightly screw on lid and then turn jars upside down to create vacuum seals (takes 30 minutes). Pickled cauliflower is one of my favourite pickles, so I just had to make it for Pickles & Preserves Week. Whenever we buy giardiniera, Jonas and I sneak around fishing out all the cauliflower florets and hope the other one doesn’t notice. When I went on my pickling bonanza I thought it was time to solve the problem, cut out all the other veggies and just gorge on pickled cauliflower. This is a very aniseed flavoured recipe, due to the presence of fresh tarragon, and Steve Manfredi suggests dressing the drained cauliflower with olive oil, salt and pepper then tossing it with chopped chilli and parsley as part of an antipasto plate. If you’re not keen on aniseed flavours, simply omit the tarragon. An adaptation of an adaptation from "Chez Panisse Vegetables" by Alice Waters. 1. Place cauliflower florets, garlic clove, bay leaf, tarragon and chilli in a sterile preserving jar. 2. Bring vinegar, sea salt, black peppercorns and mustard seeds to the boil and boil for a minute. 3. Pour boiling vinegar it over the cauliflower, which should then be covered with vinegar. If it isn't, simply boil more vinegar to top it up. 4. Secure the lid and invert the jar to create a vacuum seal. 5. Store the jar in a cool, dark place for a month before using. This is the jam that launched a thpusand ships. OK. maybe not, but it did launch Pickles & Preserves Week. I went to visit my high school friend, who has a second gig these days as SuperMum, and was presented with a pretty jar of apricot jam. Well, if Suzy can make jam with a bub crawling about in the background, then surely I can make some jam too? The very next weekend I went jam crazy and haven’t looked back. This morning Jonas and I bought some delectable croissants from the bakery across the street and enjoyed Suzy’s apricot jam in its purity. Apricot jam is my favourite jam. It’s sweet and fruity but never cloying. 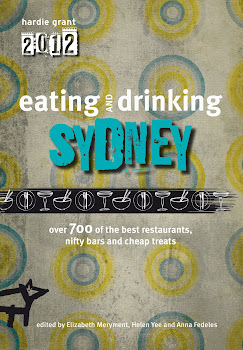 This recipe, from Australian cook Stephanie Alexander, is a winner! Recipe from the Cook’s Companion by Stephanie Alexander. Makes 5-6 medium jars. 2. Wash apricots. Halve or quarter them and remove stones. 3. Wrap half the stones in a napkin and crack them with a meat mallet. Extract kernels and set aside. Discard debris and remaining whole stones. 4. Put fruit, water and lemon juice into a non-reactive saucepan (or copper preserving pan, if you have one) and bring slowly to a boil. Simmer until fruit is just tender, around 20 minutes, or longer if you prefer your jam not to have chunks in it. 5. 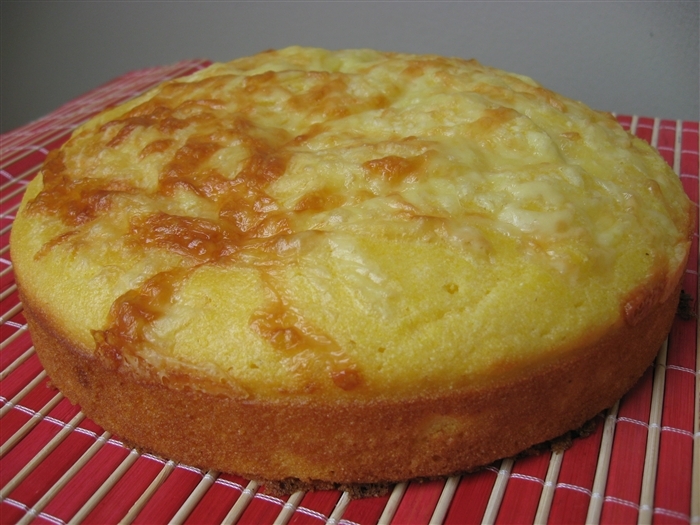 Meanwhile, put sugar into a clean cast-iron casserole or baking dish and warm it to hand-hot in the oven. 6. Add warmed sugar and reserved kernels to the pan, stirring until sugar has dissolved, then boil rapidly for about 15 minutes or until setting stage is reached (drop a small amount onto a chilled saucer for 30 seconds, run finger through the mixture and if it wrinkles rather it has reached its setting point). 7. Ladle into hot, sterilised jars, distributing the kernels evenly, and seal. When I was a teenager, my father made a batch of pickled eggs. I was sceptical of this “weird” invention of his, since I’d never heard of pickled eggs let alone seen them anywhere, however being a big fan of everything pickled I tried them and became addicted. Ever since I have wondered how he’d made them and why he never tried again. Even though it was a fixed culinary moment in my life, when I brought it up with him he barely even remembered making them. But it wasn’t a dream. And here I am replicating these great snacks for my ovo-lacto vegetarian husband as part of a 2008 food resolution to recreate this great food memory (part of my Pickles & Preserves Week). Pickled eggs are perfect snacks. Apart from matching well with beer and other savoury drinks, they give Jonas something to munch on late at night after he comes home from the restaurant. And better still they remind me of my father’s love of pickles and his adventurous, experimental spirit in the kitchen. I’m hoping his recent retirement will bring back this love of cooking, which was instrumental in inspiring me. Anna’s very own recipe. Makes 12. 1. Put vinegars, water, sugar, bay leaves, mustard seeds and peppercorns into small pot and bring to the boil. 2. Place some onion in the bottom of the jar then some eggs and then some more onion until you’ve used them up. 3. When vinegar has come to the boil pour into jar over the eggs. 4. Seal immediately turning upside down to sterilise lid. 5. Refrigerate for 2 weeks before serving. 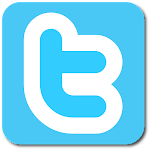 Use within 2 weeks of opening. As I have said before, I’m not a big grapefruit fan, but I’ve been trialling recipes recently and here is my second brilliant success. This is the launch of my Pickles & Preserves Week. It’s not a blogging event, it’s just my commitment that every day for the next 7 days I will share one of my pickles or preserves recipes. You see, I must confess that I’ve gone a little jam and pickle mad lately. After a visit to a friend's house and walking out with a jar of her brilliant apricot jam, I was inspired to make my own. And so I did. Three kinds in three weeks. And pickles too. Every time Jonas came home, I was bottling something new like an insane 1950s housewife. I have found a new passion and so I want to share it with everyone through my Pickles & Preserves Week, starting today with a Grapefruit, Rosewater & Vanilla Marmalade. I can’t claim this is my invention, that brilliant accolade goes to Mercedes from Desert Candy, a blog I recently discovered and which became an immediate favourite of mine. The vanilla and floral sweetness from the rosewater balance out any residual bitterness from the grapefruit. Jonas just loved this marmalade and ate it on toast until it was all gone! Based on a recipe by Desert Candy. Makes approximately 500ml. 2. Remove the peel of one grapefruit in large strips, being careful not to take any bitter white pith. Slice peel into very, very thin strips. 3. From the peeled grapefruit, remove any remaining white pith. Peel and de-pith the remaining grapefruit. 4. Over a bowl to collect juices, segment all three grapefruit, squeezing any remaining juices from the membranes. 5. Spread the sugar on a tray and heat it in hot oven, taking care not to burn it (approx 10 minutes). 6. In a saucepan, add the water, grapefruit segments, juices and the thin strips of peel. 7. Slice the vanilla bean in half lengthways, scrape out seeds, then add bean and seeds to saucepan. 8. Bring saucepan ingredients to the boil then remove the sugar from the oven and gently stir it into the grapefruit mixture. 9. Bring to a boil again, then lower heat and simmer until the marmalade is thick and translucent (approx. 1 hour). 10. Check to see if marmalade is ready by dropping a small amount onto the chilled saucer and allowing to set for 30 seconds. Run your finger through the mixture. If it wrinkles rather than runs, it has reached its setting point. 4. Remove from the heat and stir in rosewater, then pour into jars, tightly screw on lid and then turn jars upside down to create vacuum seals (takes approx. 30 minutes). Grapefruit was first documented in Barbados in 1750 by a man called Reverend Griffith Hughes who believed the grapefruit was one of the “seven wonders of Barbados”, although it was known as a shaddock or shattuck until the 1800s. The USA is the world’s top producer of grapefruit, where it was introduced to Florida in 1823. China and Mexico are the two next largest producers. The grapefruit is a subtropical, evergreen citrus tree with fruits of white, pink and red pulps, each varying in sweetness. only became popular with the commercialisation of the red grapefruit varieties in the 19th century. Grapefruit is high in vitamin C, pectin fibre and the antioxidant lycopene. It is also said to lower cholesterol and its low glycemic index helps your metabolism to burn fat. This recipe is my contribution to Weekend Herb Blogging, hosted by Gay from A Scientist in the Kitchen. Enjoy! Dhivya from Culinary Bazaar has launched an exciting new vegetarian cooking event, covering a new country every month: A Worldly Epicurean’s Delight or AWED for short. For the first very month, our country of focus will be Mexico. What a great choice! There are so many vibrant, flavoursome options to choose from. And what better ingredient to focus on than one featured in the Mexican coat of arms? Can you spot it? The spiky cactus perch under the eagle? I am talking about nopales, the young paddles of the prickly pear cactus. The Mexican Coat of Arms depicts the founding of Tenochtitlan, the Aztec capital. The Aztec god, Huitzilopochtli, told the nomadic tribe that they should settle where they found an eagle devouring a snake, perched on a cactus, growing from a rock in the middle of a lake. Kind of specific. Their divine sign came two hundred years later, in 1325, and the Aztec (Nahuatl) word for the Opuntia cactus, tenochtli, named the city. And where is Tenochtitlan today? Buried beneath modern-day Mexico City with the original market square smack bang under Mexico City's own zócalo (main square). Native to Mexico, Opuntia cacti are most commonly farmed from the Opuntia ficus-indica, although most Opuntia cultivars are edible anyway. The cactus can be sold fresh, canned, bottled or dried. In Australia, where only really the fruits are harvested, we import bottled nopales from Mexico, but I'm sure in other countries you could get your hands on the fresh paddles. Fresh paddles need to be carefully prepared because they are full of cactus gel (like an aloe vera plant), however bottled nopales need only be washed and then used immediately. They are slightly sour, but are very mild and almost have a capsicum tinge to them. Nopales, also known in their diminutive form nopalitos, are quite common in Mexican cuisine, served alongside eggs or in tacos. They are also gaining popularity in New Mexican and Tex Mex cooking. They have great health benefits to them as well being rich in insoluble and soluble dietary fibre, magnesium, potassium, manganese, iron and copper as well as the vitamins A, C, K, B6 and riboflavin. Nopales also reduce the glycemic effect of a meal. Opuntia are a genus in the cactus family Cactaceae and are native to Mexico and the south-west USA, but they are also very cold tolerant and can grow as far north as Canada! The cacti grow flat, rounded paddles or platyclades which contain both large, fixed spines and small hairy spines known as glochids. It is the glochids which detach from the paddles and embed themselves into skin causing significant pain. I once picked up some nopal paddles and was pricked through a thick layer of plastic. It was horrible and the pain in my fingers lasted a long time after I'd removed all the tiny spines. I can only imagine how bad it would be to get one in your tongue or throat!!! The vividly coloured green, pink and deep purple fruits are known as prickly pears, cactus figs, Indian figs and tuna. They are edible once you carefully peel the outer layer and remove the very fine glochids (spines) to ensure they do not injure the throat or mouth. Opuntia littoralis has been introduced to southern Europe and flourishes in the south of France, along the Struma River in Bulgaria, in southern Portugal and Madeira, mainland Greece, Corfu, Cyprus, southern Spain and Gibraltar, Malta and southern Italy. In Sicily the fruits, known in the singular as ficurinnia, are very popular and are used in jelly, jams and drinks. In Malta the pears are eaten as a summer fruit (known as Bajtra tax-Xewk) and turned into a pink herbal liqueur known as Bajtra. In the south Atlantic island of Saint Helena, the potent Tungi spirit is distilled from the Indian Fig Opuntia. Nopales are also really important to the dye industry, as the Dactylopius coccus scale insect, which is responsible for producing naturally occurring Cochineal (red dye) is native to tropical and subtropical South America and Mexico and feeds exclusively on Opuntia cacti. Aztecs and Mayans were been farming the insect for its dye long before the Spanish conquest and it was once an extremely valuable commodity. Due to recent discoveries that artificial red dyes have carcinogenic effects, the natural Cochineal has become commercially valuable again and harvesting operations have sprung up all over the world, even Australia. Anna & Jonas’ recipe. Serves 2. 1. Drain and rinse nopalitos. Soak in a bowl water for 2 minutes. This helps to remove any remaining slime/gel. 2. 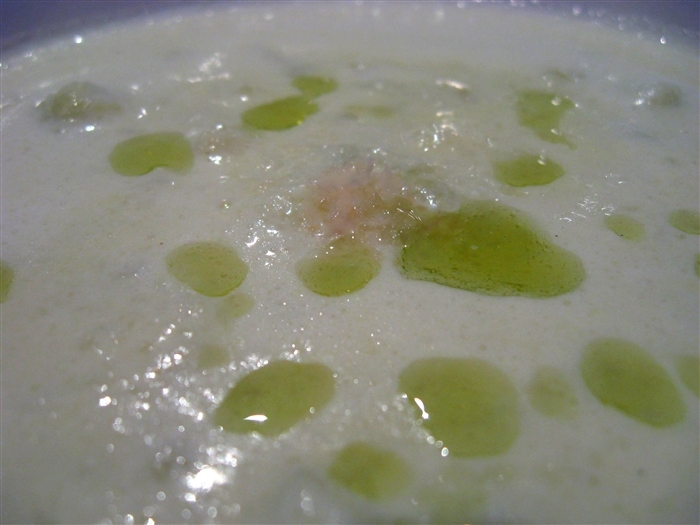 In a bowl, whisk together lime juice, vinegar and olive oil. 3. Drain the nopalitos and pat dry. 4. Toss together all the ingredients with the dressing, season and serve. Variations: you could also add tomatoes or substitute cabbage for lettuce. *In Israel , the cactus fig is called tzabar (צבר). This is the origin of the slang term sabra, meaning a native-born Israeli Jew. *Opuntia stricta were imported into Australia in the 19th century, in an attempt to establish a cochineal dye industry, and quickly became a widespread invasive weed, rendering 40,000 km² of farming land unproductive. *Apart from cochineal, the red dye betanin can be extracted from some Opuntia plants directly. *Indian Fig Opuntia (and probably others) might have a reducing effect on alcohol hangover by inhibiting the production of inflammatory mediators. *The gel-like sap of Opuntia can be used as hair conditioner. *According to Reuters, some 10,000 farmers cultivate nopales in Mexico, producing around $150 million worth of it each year.